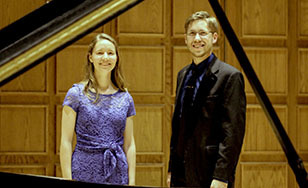 Pianists Emily Valine and David Packa. St. Scholastica opens its performing arts series at 7:30 p.m. Saturday, Sept. 30 with a concert showcasing both of the Mitchell Auditorium's Steinway Grand pianos. "Piano Squared" will feature pianists David Packa and Emily Valine, who have found that when two pianos are combined, the possibilities increase exponentially. Packa and Valine will perform a variety of works by Bach, Mozart, Milhaud, and Vesel. They will also premiere a new composition by Packa. Tickets are $10 for general admission and $5 for students. For more information, visit spotlight.css.edu or contact the Spotlight box office at spotlight@css.edu or 218-723-7000. "Cambiata" is Italian for "changed." The Cambiata concert series celebrates changing styles and the enduring value of music. The second concert in this year's Cambiata series is "Wonder & Awe: Religious Expression in Liszt & Schubert-Nick" at 3 p.m. Sunday, Feb. 11, 2018.